Lithium Polymer batteries are a favorite of ours. Very light weight and some of the highest energy densities available. A battery capable of producing 6 Amps for one hour! We affectionately call this battery the 'car battery' because it's huge. Not physically (it's 110 grams!) but because this 6Ah LiPo in capable of outputting 6 Amps over the period of one hour! This is a very large amount of power in our low-power embedded world. Please don't confuse this with a real car battery! Please: Never ever charge a LiPo with anything but a special LiPo charger! 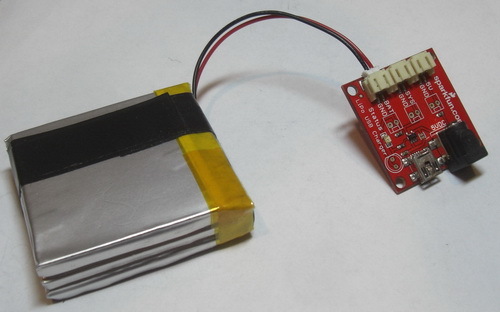 SparkFun offers two chargers to go with our LiPo cells. Our standard charger based on the old MAX1555 IC and our faster charger based on the newer MCP73831 IC. The MAX1555 was great but its limited charging current (300mA) and diminishing market availability is pushing us towards creating chargers based on the MCP73831 (500mA per hour charging rate). Here you can see a 6000mAh brick correctly attached to the USB LiPoly charger. But how do you detach the battery from the charger? If you've ever tried to pull a JST connector from a JST socket you'll find it's incredibly difficult. This is because JST connectors were designed to be used deep inside electronics where a battery or component may need to be changed only once or twice within the lifetime of the product. A very strong, firm connection was more important than ease of removal. We use JST connectors specifically because they have such great holding and are so compact! So how do you detach the battery from the charger or your embedded device? Note: Pulling on the wires will actually damage the connector! You need to get a mechanical advantage. Wire cutters have thin jaws that allow you to grip the head of the connector instead of the wires. Be careful not to cut the wires. Don't go squeezing hard on the wire cutters either. They are simply there to grip the edge of the connector. Needle nose pliers may work, but you really need to get behind the flanges of the connector. 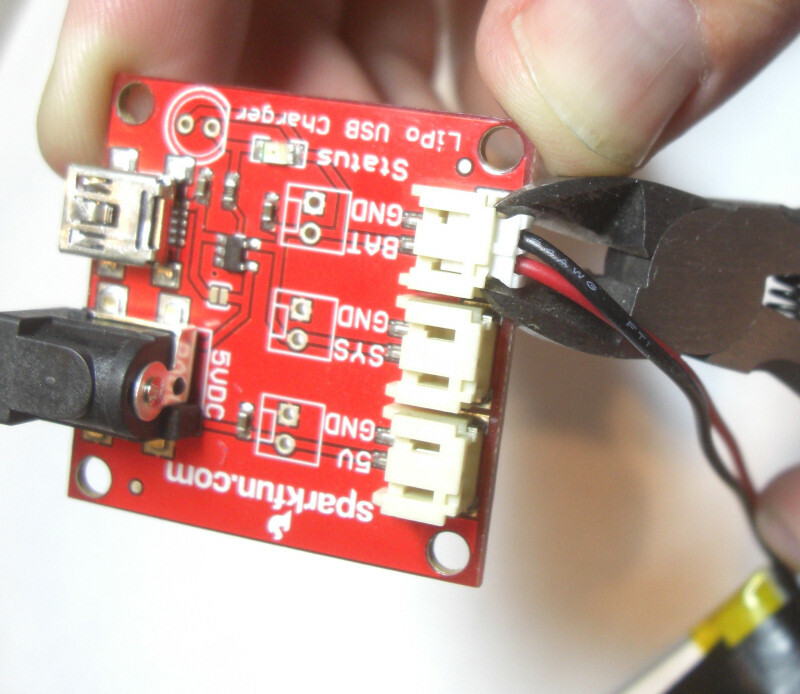 Use the edge of the PCB as a fulcrum point and lever out the connector, pulling gently sideways. After a few inserts and removals, the friction points on the JST connector will wear down slightly to the point that you will be able to remove the connector by hand. One of the down sides to using these LiPo batteries is their fragile power connections. These smaller, more fragile connectors make sense if you're embedding the battery into a hardened portable device like an iPod. But after building a few projects with LiPos, I found that under my day-to-day use the power wires would break from the terminals on the safety circuit built into the battery. Luckily for us, a little electrical tape goes a long way! 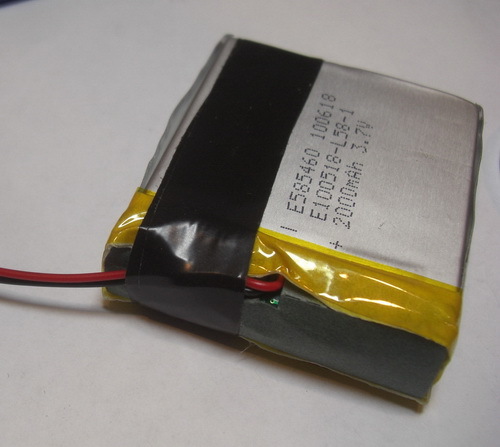 The red and black wires on a LiPo will tend to wear out and break off if you swing the battery around too much. This fix is so simple, but I find that many people don't realize what a little stress-relief can do. 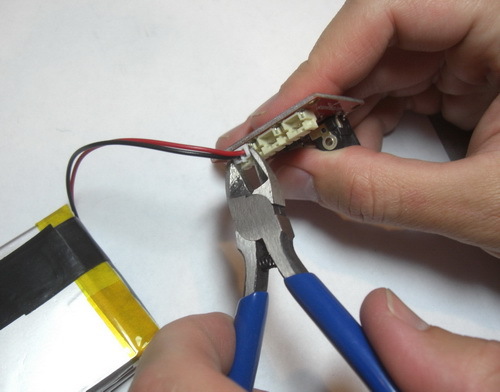 On your LiPo battery, fold the red and black wires to the side. With electrical tape, start in the middle of the battery and tape over the top. 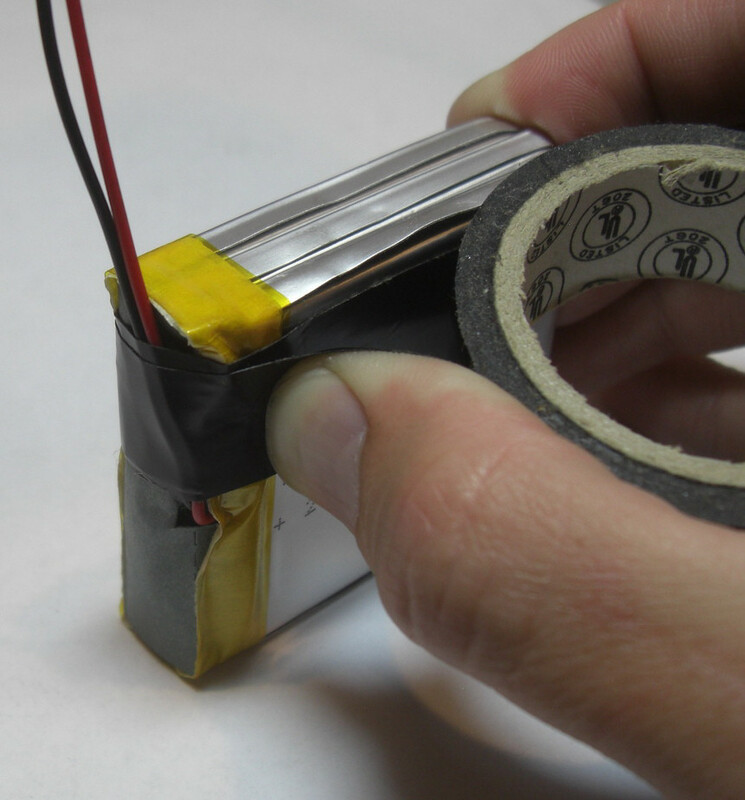 Use a little bit of tension on the tape as you go over the top of the battery. I use one and a half full wraps around the battery. I then cut the tape with wire cutters or knife to make a clean cut. Tearing the tape can leave ugly ripples in the tape. This one or two wraps around the battery serve as a simple stress relief. All the mechanical stress is transferred to the tape instead of to the soldered terminals inside the top of the battery. Now when you use (or mis-use) the battery, you won't have to worry about breaking the red and black wires from the top of the battery! I found I had a surprising collection of LiPos for various projects (they just seem to be replicating at this point!). A problem that came up a few months ago was identifying the battery. What was I doing with this battery? What torture had I put it through? 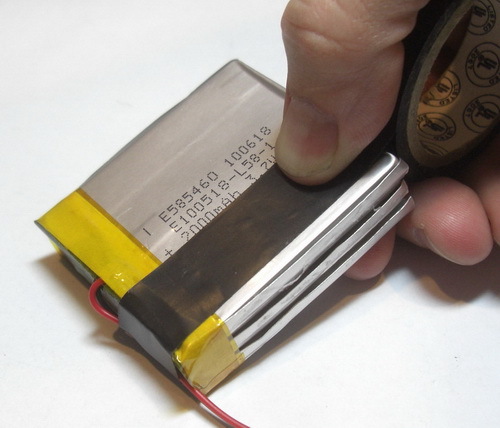 A sharpie marker is perfect for marking your battery. A name such as 'heater' or 'costume' makes a world of difference. Dating the battery will let you know when you first used it. All my LiPos are still working swimmingly, but after a few years I assume these batteries will start to lose some of their capacity. A date code helps to indicate that general health of a cell. Remember, a safety circuit is built into every pack that we sell. The safety circuit will prevent over voltage (over charging), over current (the battery will turn off if there is a short in your system), and under voltage (the battery will turn off before it runs down too low). This safety circuit prevents most misuse of the battery and we have definitely misused some batteries. You can be re-assured the safety circuit will protect you and the battery. Another way that isn't as risky as diagonal cutters near your wires: use a staple puller. The kind with the jaws and opposing "teeth". the narrower set of "teeth" fits exactly over the connector and you don't run the risk of accidentally severing the wires. Shaving the retention tabs seems more convenient for a battery that in and out of a device though. There is no such thing as a "500mA per hour" charging rate - it's simply 500mA (which is the same as 500mAh per hour). Lots of confusion here. It's like kWh that your electric company charges you for power. They can't measure Watts only because it varies over time. A 100W light bulb consumes 100W. But how much power will it use in an hour? 100Wh. Or, 0.1kWh. Ten 100W bulbs will consume 1kWh in one hour, etc. Batteries have a certain amount of charge they can hold...measured in mAh...milliamp-hours. 850mAh means the battery can supply 850mA for one hour...or 425mA for two hours...or 1mA for 850 hours. Of course, this is not an exact science and you may be able to get more or less power out of a particular battery depending on exactly how fast you discharge it. This honestly has nothing to do with how long it takes to charge the battery. And, of course, there are limits to how fast you can discharge the battery as well. 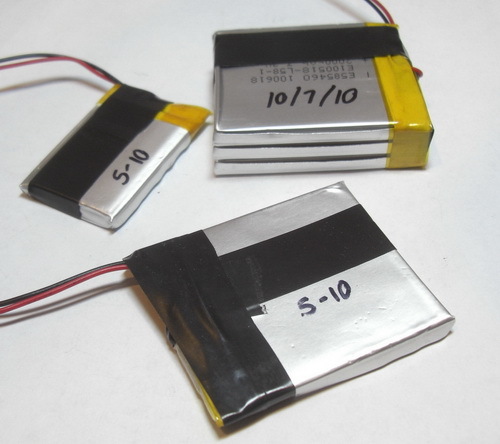 All the Lipo batteries I'm aware of and certainly all of those sold at Sparkfun have overcurrent protection which limits the rate at which they can be discharged. You may even want to consider limits beyond those imposed. The wires and connectors are quite small and won't be able to carry much current without overheating and melting. I am sorry but you are incorrect, mA refers to the amount of current flowing, mAh refers to how much current CAN be used. I believe you are in error. If you are expressing the instantaneous rate at which current is flowing from the charger to the battery, 500mA would be correct. If you state that the charge rate is 500mAh, you would instead be expressing the amount of additional energy stored (charge delta) in the battery over a specified period, and should properly say 500mAh/hr (or other unit of time - 500mAh/min, 500mAh/sec, etc.). Since it would be difficult to predict the charge delta, especially given that the battery being charged is an unknown, I assume that we are speaking of the instantaneous rate at which current is flowing. As an example, if you were to chill a LiPo cell to below freezing and attempt charging while maintaining a certain instantaneous current flow for a specified period of time, you would have a very different result than you would within the prescribed charging temperatures. I believe we are of practical necessity talking about the charger's capability in terms of instantaneous current flow, making 500mA, and not 500mAh/hr correct, although if we can predict the charge delta, then a charge rate expressed in mAh/hr could be perfectly legitimate - but somewhat different in meaning. Ideally, SF should correct the text above to state "mA" not "mA per hour". Even if they were stating charge delta, they would at least need to amend it to mAh/unit of time. You have no idea what you are talking about...mAh/hr = milliamps per hour per hour? get off the grass mate! mAh/hr = milliamp hours per hour. in this context, "milliamp hour" is a unit of measure, not a rate of discharge. all they're saying is it takes an hour to charge a 500mAh battery. no need for insults or excessive hair splitting. - per hour is /hour (as in 500mA /hour - which doesn't really make sense). - 'for an hour' is * hour, or in short 'hour' (confusing, yes I know) as in mAh, which means 'so many milliamps for an hour'. - 500mAh per hour is indeed just 500mA and doesn't mean much. I guess it meant to be 'drawing 500mA from a 500mAh battery for an hour'. Regarding the JST PH connectors, I really wish SparkFun had chosen a connector with 2.54 mm pin spacing instead of the non-standard 2.00 mm pin spacing that makes it unnecessarily difficult to put connectors on breadboards or protoboards. I had a lot of problems with the 'JST' connectors SF sells then went and bought some actual JST brand (TM) from digikey for a different project and they actually work so much better. Not sure why that is but ripping the wires out once was enough. 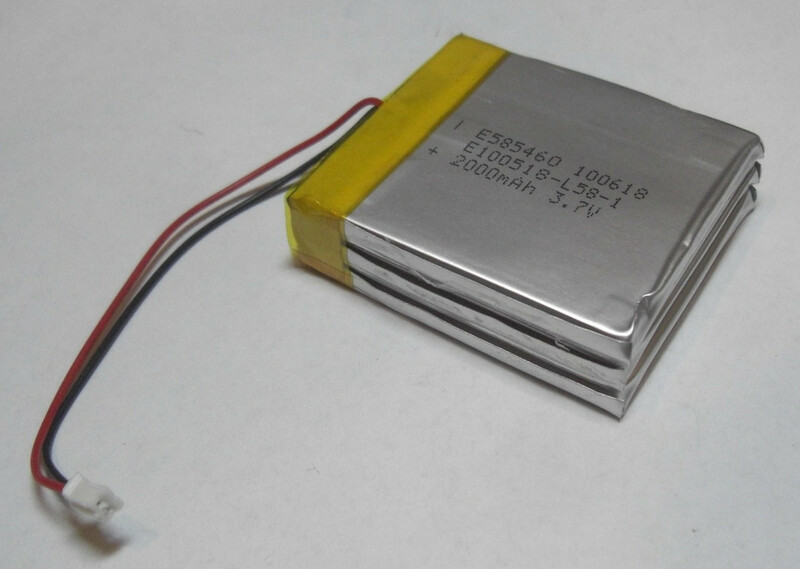 There are tabs on the sides of the battery connector ("friction points on the JST connector"). I simply trim these down by about half their height with a modeling knife. No pliers necessary. And yes, it will still 'snap' into place. Glad to see goop was mentioned, but not the Goop I use as stress protection - on both the LiPo battery & JST connector ( being extra careful not to allow the GOOP to get beyond the ridges OVER WHICH the Goop grabs -making sure the bottom remains flat & includes a tiny bit of wires as they enter the connector- we are talking about a very small BB sized ball of GOOP - I wet my fingers for non stick - before compressing the GOOP for perfect coverage). This in addition to electrical tape which follows the GOOP'ing and provides wire pull-out protection (and a better, safer grip point) for JST Connector removal. I use my round nose pliers to remove stubborn JST-PH connectors instead of diagonal cutters. AFAIU LiPo batteries are also sensitive to being punctured or dropped, which can cause internal short-circuits and ultimately fire. It would be good if this tutorial also discussed these issues? And perhaps some info on figuring out charge rates from datasheets (e.g. what 1C charging means) would be useful too? Hello, does this battery can properly feed an arduino mega 2560? Does anyone know which connector the battery connects to i know its a JST connector but which kind exactly? If a power wire gets detached from the battery terminal, and is still attached to the JST connector, is it possible to reconnect it to the battery? We replace the wires on these batteries all of the time. First, remove the Kapton tape that is used to protect against shorts. Then carefully, with a fine tipped soldering iron remove the broken length of wire and re-tin the pad with a small blob of solder. Strip and tin the remaining wire (this assumes that the wire broke right at the battery) and then careful re-solder it to the tab. 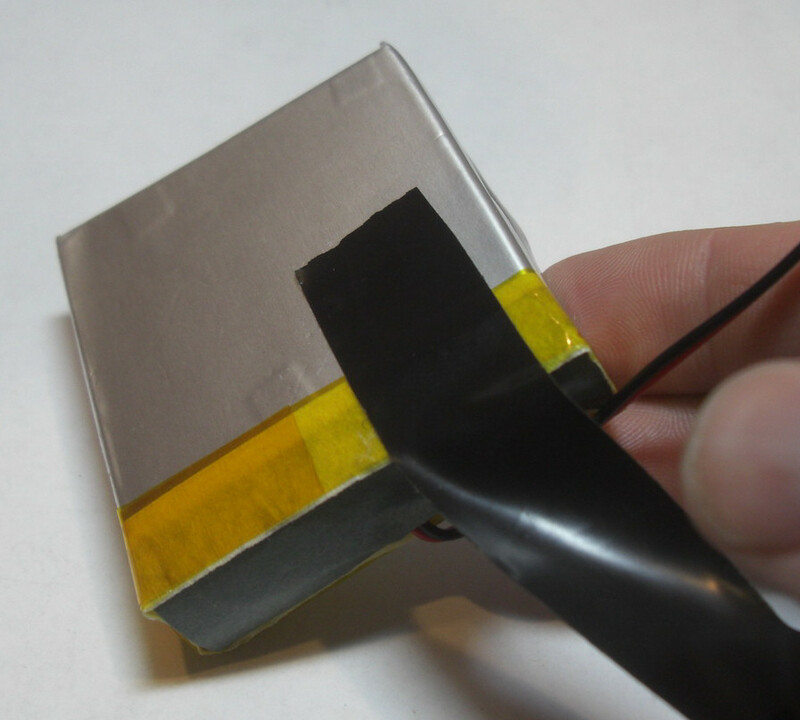 Wrap the end of the battery as it was before with Kapton tape or other insulating coating. We have performed this operation to every one of over 30 of these batteries that we have purchased from Sparkfun without a single "popped" battery. We replace the JST connector wire assembly with a male micro USB connector wire assembly. Then we goop the wire end of the battery with Hardman Double/Bubble A-85 Urethane for insulation and strain relief. after this fully cures we dip the whole thing in black Plasti Dip. Generally you aren't going to get it connected back easily. We've had customers try and usually it ends with a popped battery. If you're going to be using the battery in an application where this may occur, you might want to reinforce the connections at the battery by taping down the wires if possible before installation. I have done the "Pliers on the connector" trick a few times, and honestly, it's a real pain in the arse. A better way is to take a sharp knife and remove the locking nubs from the plug on your batteries, it will still have enough friction to stay plugged in during normal use, but not so much that things break when you try to get it out again.